One can fairly safely conclude that we're not in Kansas anymore, Toto, given Aussie drinkers can now get their hands on two locally brewed imperial IPAs in cans. You couldn't even get local craft beer in cans three years ago, godammit! When SA's Pirate Life opted to pop their 8.8 percent ABV beauty in cans – in 500ml longtubes, no less – when they launched earlier in the year, it felt like it could be a gamble, yet, having spoken to one of the brewers recently, they've been a roaring success. 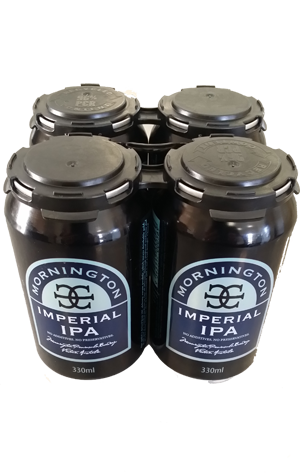 And now Mornington's highly fancied take on the style becomes the third beer from its core range to get the tinny treatment. The Victorian brewer's IIPA weighs in at 8.5 percent ABV and, like its little sibling IPA, is a showcase for American hops that contribute punchy aromatics, a resinous body (alongside a solid malt backbone) and a big bitterness. In a can.